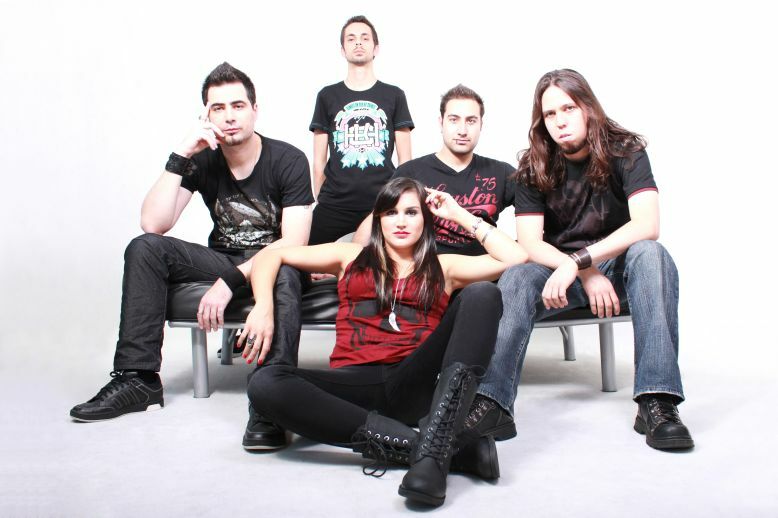 Poised for a breakthrough, Portugal's Chaos in Paradise is a dark, melodic metal band with similarities to Lacuna Coil, In This Moment, and Evanescence. 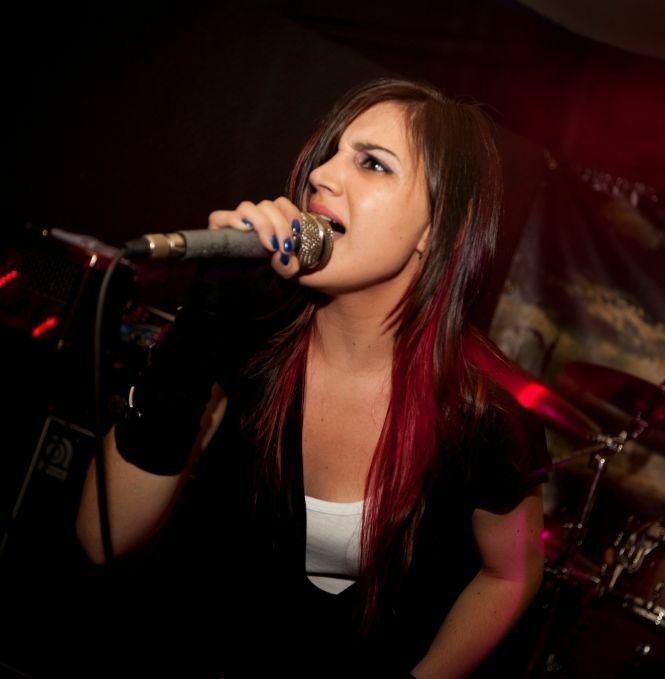 Fronted by Sara Valente, whose versatile voice is comprised of equal parts honey and venom, the band recently released their EP Let the Bliss Remain. Sara generously donated some of her time to answer a few questions for Harvest Moon Music's Women of Heavy Metal interview series. [HMM] For readers unfamiliar with Chaos in Paradise, would you introduce the band? 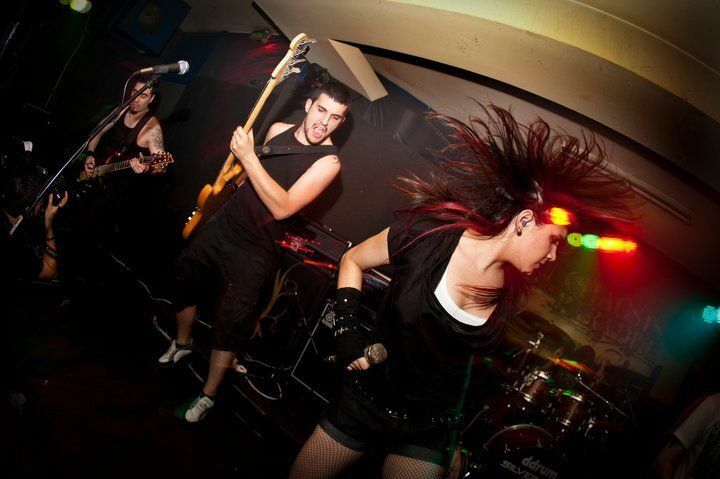 [Sara] Well, we are a female-fronted metal band from Oporto, Portugal. We are a group of five individuals: Quik on drums, Alex on guitar, Pedro on guitar, Bruno on bass and me, Sara, as the leading voice behind a progressive metal band based on every element’s passion for music and above all, a great friendship. How and when did the band come together? The first time CIP came together was in 2008, and the band started in Quik’s garage, initially with Quik and Alex, who immediately began the auditions to fill the empty spots on the band. Pedro was the first to join them, then 19 and at last me. There were other people involved in the project at the very beginning of it, including bass player Rui Ferreira and another female vocalist. So it was only in 2009 that the band found the solid and last formation. Unfortunately, early this year, 19 left the band, but then Bruno joined us and we now are all heading for the same purpose and ready to rock! 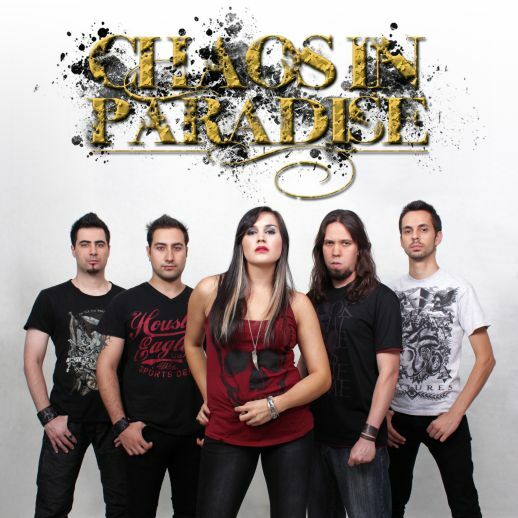 Is there a story behind the name Chaos in Paradise? It was a little hard to choose the name Chaos in Paradise, but in the end it made total and perfect sense. The beauty in the music we make is that we have amazing and beautiful guitar riffs that remind us of "Paradise" and we mix them with those heavy catchy riffs and powerful drums creating a strong and chaotic emotion. The vocals complete it with sweet melodies and at the same time fearless screams. So, what we really want is to create an atmosphere connecting the best of these two worlds. You mentioned that bass player 19 left Chaos in Paradise earlier this year. Do you mind sharing details about the split? Truth is we noticed the path we wanted to carry on with was different from the one 19 wanted. At that moment we all came to an agreement and the best thing to do was continue without him. He was a great influence to the band and watching him leave was very sad, but as his friends we knew this was the right thing to do and so did he. Now he is working on other projects he already had and which he’s very happy with. We support him on this new chapter and wish him all the best. After a fair number of auditions, Bruno Martins was brought in as your new bass player in August. What is Bruno's background? Bruno is a self-taught musician and started playing bass 10 years ago. He is from Brasil and moved to Portugal in 2009. In Brasil he has played in six different bands, one of them symphonic metal and even had a pop-rock band too. Currently he is with Chaos in Paradise and also plays bass with another metal band from Oporto. The band's second release, the Let the Bliss Remain EP, was released in 2011 and has received a lot of praise. Are you happy with feedback so far, and is there anything about the EP that you would have done differently? Who created the cover art? The cover art was created by the Portuguese designer Augusto Peixoto, from Irondoom Designs. After a careful search from many designers, national and international, we knew he was the right choice. He came up with the concept and we liked it since the beginning. How do you feel the band's sound evolved from your first, self-titled demo to Let the Bliss Remain? Our "Demo" is so much different from the EP, and considering both, you can see huge progress in every aspect. All the recording from the "Demo" was in our own rehearsal room, lead by Quik. As for the EP, it was a positive experience for us since for some it was the first time recording on a professional studio (SoundVision Studios at Vila do Conde). Song writing, artwork, lyrics, were all done by ourselves and we are proud of everything we’ve accomplished and convinced we took the right direction with this last work. Will there be changes to the Chaos in Paradise style on your next release? Yes, as you might know, we already started writing songs in a lower tuning. For this album we expect to deliver heavier songs, never forgetting our roots. Despite of the differences you notice between the "Demo" and Let the Bliss Remain you can find some reminiscences and similar aspects between them, we always hold this on our minds, but in this album we will also be preparing some surprises. Hopefully, we will do something special and mind-blowing. How is the new album coming along? We are taking our time without rushing anything. We want to be sure we’ve done everything perfectly and we want to be even more satisfied than we were with the EP. Some of the songs are completed and we are confident with the choices made so far, also, we started creating the album concept and currently we are seeking other Portuguese designers and producers. It’s a priority to us working with different people and having different experiences, but above all, creating something from our own country, doing all that has to be done involving Portuguese people in every feature. Chaos in Paradise recently played a fourth anniversary show at Metalpoint in Porto. How do you feel that went? It was one of the most awesome nights for us! Just amazing! We were surrounded by friends and fans that have been following us since the beginning of the band. It was a night full of surprises. We played at the spot from our very first gig, called Metalpoint, in Oporto. We gave away five special editions of Let the Bliss Remain, made a commemorating video to show at the gig, brought a huge cake and some bottles of champagne and played an exclusive new song that will be part of our first album. Of course people went nuts when they heard we were playing a new song, but we felt they deserved it. After the gig, the party went all night long and for sure is a night for us to remember! Most of your touring has been in Portugal, with at least one appearance in Spain. Are there any plans in the works to play shows or festivals in other locations? We haven’t played a lot outside Portugal but we are ready to start it at least throughout Europe on a first approach. At this time it’s almost unthinkable, but once we have finished the album recordings, it’s the right step to take. We hope it’s soon because we are excited to visit and spread our music live in foreign countries! Are there any interesting stories from previous gigs that you’d be willing to share? Our gig at Spain, for example, was awesome but we had a huge setback! We decided to go from Oporto to Madrid with two cars so we could carry all the equipment and also bring some friends. The trip to Spain was great and the show was pretty nice but when we were returning to Portugal the day after, one of the cars broke down and Quik, Alex and I had to wait for three hours for the trailer and had to rent a car to return home. Because of the assurance company, we had to rent the car in Madrid and had to drive through all Spain to Vigo and then someone hired by the company would pick us up there and drive us home. Nevertheless we ended up having a great experience since we ended up discovering beautiful places in that trip! Is there one song in particular that you love to perform live? In fact, for me, there is! It’s a song from Let the Bliss Remain called "Beyond the Horizon". It’s my favorite song and every time we play it I feel we can deliver a strong and positive message and of course, we love to see the audience head banging on the breakdown! And also, we all love to play our song from the music video, "Sanzu River". Your video for "Sanzu River" is outstanding - very professional and well-produced. How involved was the band in the concept of the video? The whole concept was developed by Chaos in Paradise. We created the story and also produced the video, so we were deeply involved with it. We then contacted 2Spot Media to film it. They loved the project and helped us by making some changes and adding some details. We owe them so much for their great job and the results, as you can see, are just amazing, greater than we expected! The performance scenes from the video were shot at night in the middle of winter. How fun was that? Not so fun as you might think! We’ve chosen a large field, normally used for wedding parties that had a river right in front of it. We were there from 5pm to 8pm preparing the scenario and then we started shooting right away. From 8pm to 3am we faced a terrible cold weather and I remember at one time we went to check the temperature: - 2°C! We were not dressed properly to those temperatures and proof of it is our breath that you can see in the video! Already facing the cold we had another problem too because the grass was a little icy so we kept slipping! It was a great experience for us and we had a lot of fun too, but we learned our lesson, next time we will shoot our music videos in the summer! The lyrics to "Sanzu River" are pretty dark, and the title (I'm guessing) refers to the Buddhist "River to the Underworld". Where did the inspiration for this song come from? The lyrics on this song refer to an important person on my life, my grandma. She unfortunately passed away too soon on Christmas time, when I was 10 years old. She raised me, so I felt I needed to give back something to her and this song made it possible. If you read the lyrics you understand the pain of her loss but at the same time the will to do better and go through it letting the pain in the past. Is the songwriting process for Chaos in Paradise a group effort? Definitely! All the songwriting is done by us and everyone participates. We discuss every detail and if someone doesn’t like something, even if it is a little note somewhere we try to change it and make everyone happy. Chaos in Paradise has a very strong social media presence - frequent Facebook updates, videos, etc. How important do you feel social media is to emerging bands? Nowadays social media is a big deal and it’s our way to show our fans exclusive stuff all the time. We think it’s important to make our fans feel more involved with our work, and of course, have contact with people from all around the world. For an emerging band there’s no better way to do this than through internet. How long have you been singing, and what led to your involvement in heavy metal? I’ve been singing since I was 8 years old and for 10 years I sang in an amateur choir as a soprano. But at the age of 14 I started discovering metal and felt something I’ve never felt before. As I belonged to the choir, at first I started listening to symphonic metal bands with female vocals, but since then I’ve explored a lot of other metal kinds. I felt the need to start singing a different style, so I joined a rock band of covers and then another band, this time metal and with original songs. None of them were truly what I wanted at the time but then I found out Chaos in Paradise were searching for a vocalist, I applied to the audition and here I am now, 3 years later and happy with my choices. If there was one bit of advice that you could give to a woman with aspirations to sing in a heavy metal band, what would it be? Being a woman in a metal band sometimes leads to controversy, so what I would say is just to follow your dream, never giving up and putting your heart truly into it. It’s a tough world out there and being in the music industry can be ungrateful so many times, so whatever the style of metal it is, do it with passion! Finally, do you have any parting words for your fans and for those who may be reading about Chaos in Paradise for the first time? I would like to thank everyone for all the support so far that has kept us working with even more passion! For those who are hearing about us for the first time, if you like metal with heavy riffs and some nice melodies and groove, you can check our Facebook page at www.facebook.com/chaosinparadise and also our YouTube page at www.youtube.com/chaosinparadise. You won’t be disappointed! Thank you so much Sara! I'm looking forward to hearing your new material.